General Characteristics: Medium in height, moderately spreading, maturing within 8 to 10 months, producing from 5 to 10 oha; characterized by reddish-purple petioles with inconspicuous yellowish-green stripes. Petiole: 70 to 95 cm. long, red near base shading to reddish-purple above, with inconspicuous yellowish-green stripes especially on midsection, indistinctly dark reddish at edge, a dark red ring at base with dark pink for 3 to 5 cm. above. Leaf blade: 35 to 45 cm. long, 25 to 35 cm. wide, 25 to 35 cm. from tip to base of sinus, ovate, dark glossy green with bluish cast; piko large, distinct, purple; primary and marginal veins reddish on lower surface; lobes obtuse with narrow sinus. 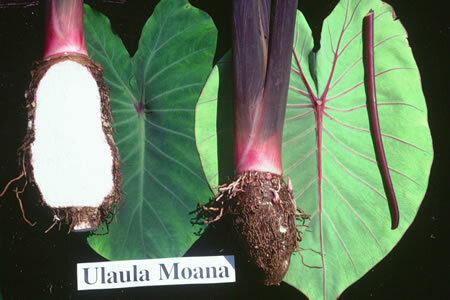 Origin, and derivation of name: Native variety; named after the Hawaiian fish, moano, which is reddish to reddish-purple with brownish markings. Distribution: Planted in a few scattered localities throughout the islands, usually under upland culture. Use: Both for poi and as table taro, principally for home consumption.